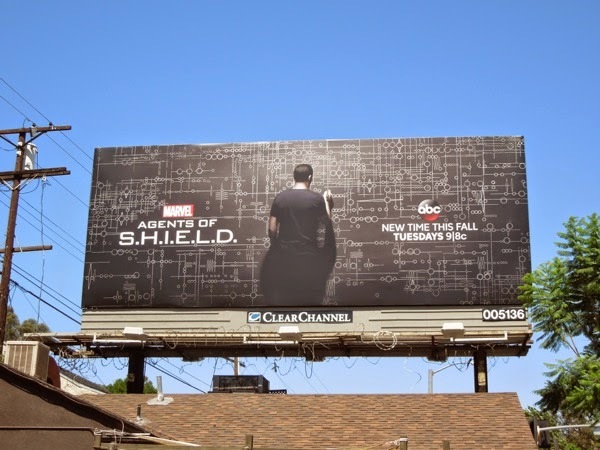 Not only did Captain America: The Winter Soldier blow up the box office earlier this year, earning over $714 million at cinemas globally, but it also provided a much need jolt of adrenaline for Marvel's first episodic TV series that ties into the larger cinematic universe, as Agents of S.H.I.E.L.D. was rocked to its core when it learned the peacekeeping and espionage agency had been infiltrated by HYDRA. Agent, or should I say 'Director Coulson' and his team survived the experience, but not without major betrayals and self sacrifice, plus we finally learned out how Clark Gregg's 'Phil Coulson' had been returned from the dead. At the end of the first season, tasked with rebuilding a leaner and HYDRA-free S.H.I.E.L.D. by 'Nick Fury', Coulson was last seen ominously sketching this weird schematic on a wall of their new base. What's unclear at the moment is whether he's conscious of what he's doing. What is the design? As his life was saved by a transfusion from a big blue alien, is this an alien schematic for their DNA, their language, an invasion transportation device, or something even more sinister. 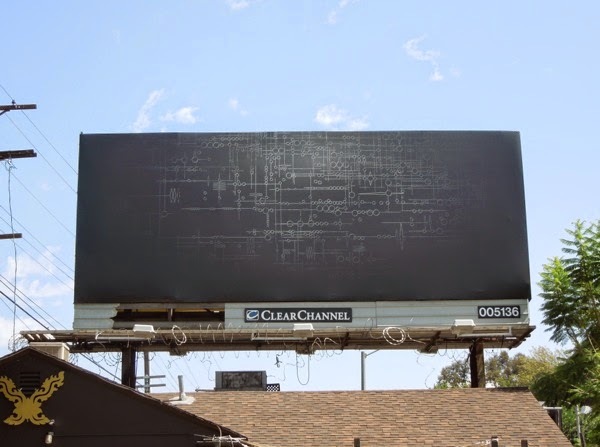 Whatever it represents this wall drawing was used as the second season billboard teaser and was spied on August 20, 2014, whilst the version featuring the head of the new S.H.I.E.L.D. organisation was snapped a week later along Barham Boulevard on August 28, 2014. With additions to the show this season including former Xena: Warrior Princess, Lucy Lawless, as a veteran agent, Kyle MacLachlan on board as 'Skye's'mysterious father, and Adrianne Palicki cast as fan-favourite heroine 'Mockingbird', plus villains like the 'Absorbing Man' causing problems in this sophomore season, let's hope the likes of 'Melinda May', 'Grant Ward' and 'FitzSimmons' characters don't get lost with this influx of familiar Marvel names and faces. 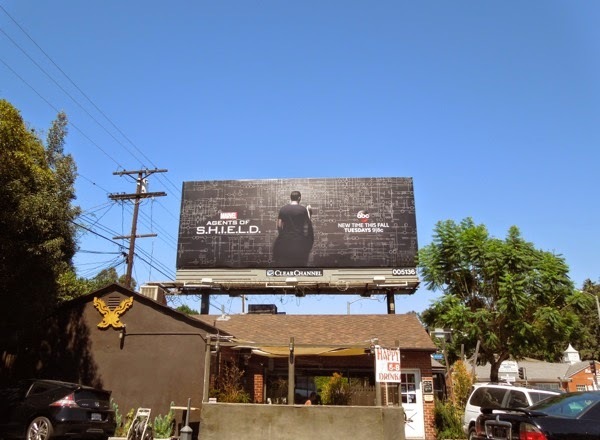 If you're a fan of the show, be sure to also check out these season one billboards for Marvel's Agents of S.H.I.E.L.D. 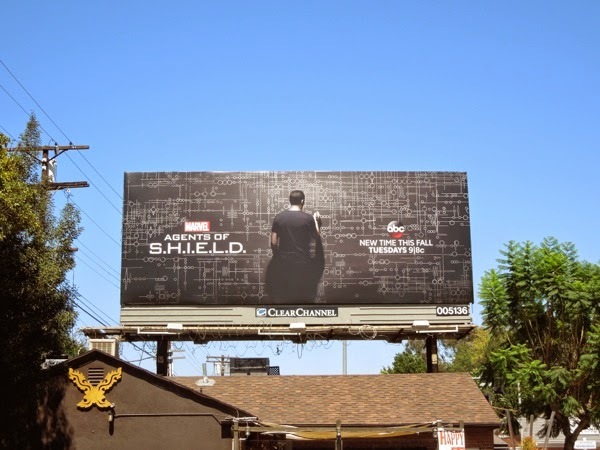 and these cool movie billboards for Captain America: The Winter Soldier. It's amazing that after their stellar series debut and subsequent fall from grace with declining viewership, the show suddenly went from zero to hero and now is one of the most anticipated returning series of the Fall 2014 season. 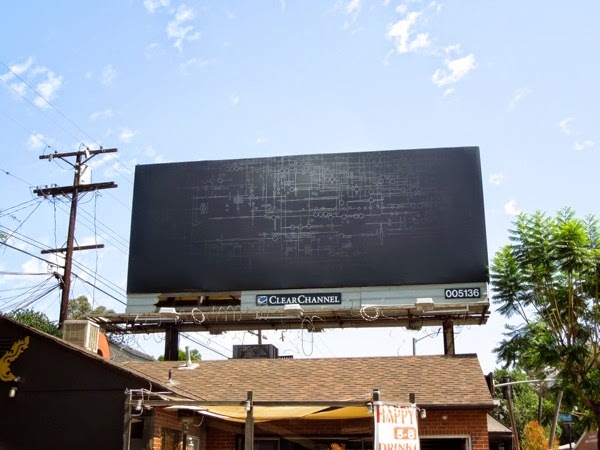 Daily Billboard for one can't wait.